Alder BuckthornDeciduous shrub. Very narrow leaves create a fine textured appearance. Narrow columna..
Western AzaleaDeciduous shrub. Western native that leafs out bright green in spring. Late spring bri..
Western AzaleaDeciduous shrub. Western native that leafs out flushed in purple then turning to brigh..
Golden CurrantDeciduous tree. Native to inland regions of the West. Light green leaves with lobed, t..
Golden CurrantDeciduous shrub. Profusely branched, creating a billowy profile, with slender twigs an..
GooseberryDeciduous shrub. Stiffly erect plant with spiny stems and lobed leaves carries delicate fl..
California Native Currant/Chapparal CurrantDeciduous shrub. Upright, fairly tidy habit. Soft pink fl..
Chaparral CurrantDeciduous shrub. Very long drooping clusters of pink buds develop into pinkish whit..
Chaparral CurrantDeciduous shrub. Originally encountered in the Ortega Mountains. Deep green resinou..
Sierra GooseberryDeciduous shrub. Small vivid red-purple and white flowers in spring along its spiny..
Flowering CurrantDeciduous shrub. Loosely branched, upright shrub. Leaves are palmately lobed and se..
CA Native CurrantDeciduous shrub. Bushy, upright shrub with textured, lobed leaves carries slightly ..
Flowering CurrantDeciduous shrub. California native. Pendulous clusters of vivid, crimson flowers ma..
Flowering CurrantDeciduous shrub. Pruned into a small, single trunk tree. California native. Pendulo..
Flowering CurrantDeciduous shrub. Profusely adorned by hanging clusters of white flowers in early sp..
Flowering CurrantDeciduous shrub. Upright growth with dark green lobed leaves and dark pink to dark ..
CA Native CurrantDeciduous shrub. 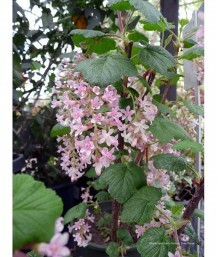 This Pink Flowering Currant is the most vigorous and showy of all ..
CA Native CurrantDeciduous shrub. 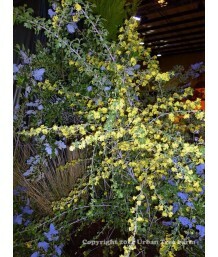 This is a bushy, roughly vase shaped shrub, about 6 feet tall in t..
Flowering CurrantDeciduous shrub. The small leaves are roundish and lobed, dark green and shiny on t..
Flowering CurrantDeciduous shrub. This wickedly spiny shrub has small leaves that are roundish and l..
ThimbleberryDeciduous cane vine similar to blackberries. Erect, thornless canes that form dense thic..